Rayleigh scattering theory is a classical (i.e. non-quantum) electromagnetic scattering theory which began life as a theory for scattering of an electromagnetic plane wave from a small sphere with real index of refraction n. "Small" in this context means small compared to the wavelength of the light being scattered. The scattering calculation is quite simple in the Rayleigh limit because the incident electric field is nearly constant over the particle, which makes it simple to compute the induced electromagnetic field within the particle. In essence, the electric field of the incident wave causes charges within the particle to migrate so that positive charge accumulates on one side and negative charge on the other, leading to a dipole moment which oscillates with the same frequency as that of the incident wave. The index of refraction is in fact a measure of the polarizability of the medium -the proportionality between the strength of the electric field and the strength of the dipole moment induced. The scattered wave in the Rayleigh limit is then simply the electromagnetic radiation emitted by an oscillating dipole, which is one of the more elementary calculations that can be done in electromagnetic theory. Figure 5.4: The imaginary index of refraction for liquid water, water ice, and CO2 ice. of a molecule (e.g .0003 pm for N2) is much smaller than the wavelength of visible or even ultraviolet light, but one might have thought that the quantum response of the molecule might substantially affect the scattering. Certainly, Rayleigh theory does not provide a suitable basis for computing molecular absorption of radiation, which, as we have seen in Chapter 4, is inextricably linked to the quantum nature of the molecule. We will not go further into the reasons that a classical theory works so much better for molecular scattering than for molecular absorption, but it is indeed a convenient turn of events. In practice, it works fine to use spectroscopically measured absorption coefficients to compute gaseous absorption, together with Rayleigh scattering to compute gaseous scattering. These results are based on observations of the index of refraction, and do not take into account variations in the polarization factors. The scattering cross sections and cross sections per unit mass for H2 are 1.4 • 10-38m2 (4.215 • 10-12m2/kg) at a wavelength of 10 ^m, 8.270 • 10-33m2 (2.490 • 10-6m2/kg) at a wavelength of 1 ^m, and 3.704 • 10-28m2 (.11 m2/kg) at a wavelength of .1 yU,m. Tray is the optical depth due to Rayleigh scattering at 1 ^m for a 1 bar atmosphere of the indicated gas under Earth gravity. by 3(2 + S)/(6 — 7S), where S is the depolarization factor, which is a property of the molecule. The depolarization factor is zero for a spherically symmetric scatterer. For our purposes, the effect of the depolarization factor is not very consequential. It has a value of .054 for O2, of .0305 for N2 and .0805 for CO2. These lead to only a minor increase in the scattering cross section. where N is the number of molecules per unit volume. This is a very useful relation, as it allows one to determine Rayleigh scattering cross sections through simple measurements of the refractive index, which can be carried out by straightforward measurement of the angle of deflection of light as it moves from a transparent solid container (e.g. glass) into the gas. Table 5.2 gives the measured Rayleigh scattering cross section relative to H2 for a number of common atmospheric gases, as well as the corresponding cross-section per unit mass. 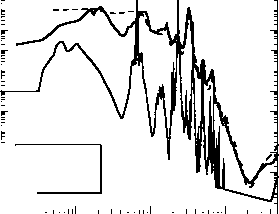 The absolute value of the cross section for H2 is given for a number of wavelengths in the caption, allowing the actual cross sections for the other molecules to be readily computed; the values given for H2 in the caption deviate somewhat from the 1/A4 wavelength scaling because of the slight dependence of index of refraction on wavelength but generally speaking it is adequate to extrapolate to other wavelengths using the fourth-power law. He stands out as an exceptionally weak scatterer. Most of the rest of the molecules have scattering cross-sections per unit mass which are moderately smaller than H2, with the exception of CH4,which is moderately larger. To get an idea of how important the scattering is in various contexts, we can use the cross sections per unit mass to determine the optical depth of the entire column of an atmosphere. When the optical depth is small, the atmosphere scatters hardly at all, but when optical depth becomes large a significant amount of radiation will be scattered; in the case of the incident Solar radiation, this means a lot of the incident beam will be reflected back to space. The last line of Table 5.2 gives the optical depth for an atmosphere consisting of 1 bar of the given gas under Earth gravity. One can scale this up to other planets by multiplying by the appropriate surface pressure, and dividing by the planets' gravity relative to Earth gravity. The optical depth values are given at a wavelength of 2 ^m, in the center of the visible spectrum, which is also near the peak of the Solar spectrum. For Earth's present atmosphere, the optical depth is small, but not insignificant; Rayleigh scattering affects about 12% of the incident beam. For an Early Mars having 2 bar of CO2 in its atmosphere, the Rayleigh scattering is quite strong, owing to the somewhat elevated scattering cross section of CO2 relative to air, to the low gravity and to the extra surface pressure. The Rayleigh optical depth for Early Mars would be 1.03 in the visible. The associated reflection of solar radiation is a significant impediment to warming Early Mars with a gaseous CO2 greenhouse effect. If one took away the reflective clouds of Venus, the CO2 Rayleigh scattering would still make Venus quite reflective, since the optical depth of a 90 bar CO2 atmosphere on Venus is nearly 20. A 1.5 bar N2 atmosphere on Titan would have an optical depth of 1.45 in the absence of clouds. The top 10 bars of Jupiter's mostly H2 atmosphere would have an optical depth of 1.6, and likewise scatter significantly. The optical depths for other wavelengths can be obtained by scaling these results according to 1/A4. 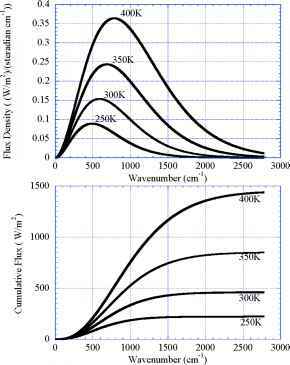 Thus, at thermal infrared wavelengths which are 5 times or more greater than the one we have been considering, the optical depth is at least 625 times smaller; Rayleigh scattering is insignificant at these wavelengths, which is why it is safe to neglect gaseous scattering when doing computations of OLR. On the other hand, the Rayleigh scattering optical depths are at least 16 times greater for ultraviolet. We will learn how to turn these optical depth values into planetary albedos in Section 5.6. From this we see that Rayleigh scattering is mildly anisotropic, with stronger scattering in the forward and backward direction than in the direction perpendicular to the incident beam. For 8 = 0 the scattering is twice as strong in the forward and backward directions (© = 0, n) as it is in the side lobes (© = n/2). Increasing 8 reduces the anisotropy. In fact, laboratory measurements of the intensity of side vs. forward scattering provide a convenient way to estimate the depolarization factor.